Just as every year we're able to have enjoyable gaming experiences, there exists quite a few instances where we do not. What makes these instances sting a bit more is the fact that we have placed a higher amount of expectation upon them than the average title. Is it our fault that they fail up to live them? Possibly. Then there are the examples where questionable design decisions were implemented and the end result leaves something to be desired. This is my number one example of underwhelming left overs from this year. If you were to tell me that my number one game of 2011, the almighty Saints Row: The Third, would be getting downloadable content, I would be all over it. If you were to tell me that I could get all that additional content at a discounted price, I would be throwing my money at you at a rapid pace. Considering what developers Volition did with the core game, I had no doubt that any DLC would further embrace the over the top nature of SR3 and deliver satisfying experiences. 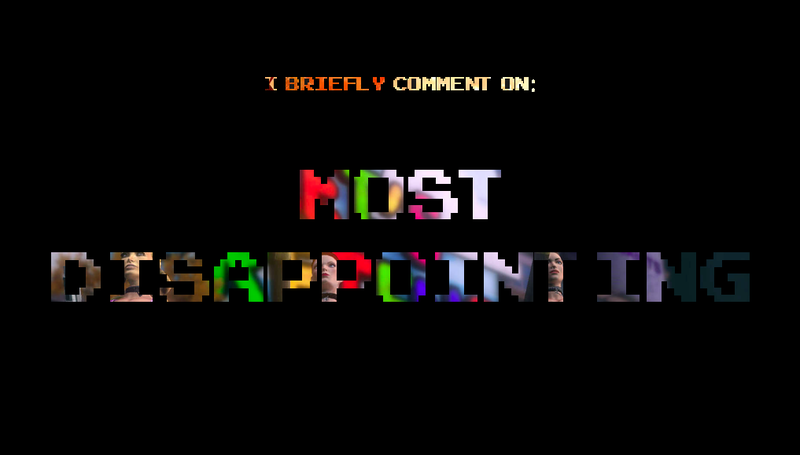 Of course, I was wrong. The first pack, the Genkibowl VII add on, was nothing more than an extension of one of the core game’s side activities. Everything you were given was essentially re-skins of preexisting side missions and vehicles. To make matters worse, it didn’t even utilize the game’s original voice actors for your character in its cutscenes, and instead gave you a generic one modified by some voice distorter. The second offering, Gangstas In Space, was a return to the Saint’s Row over the top feel. There were explosions, there were aliens and of course, there was crude humor—arguably the best part of the Seasons Pass. Its overall run time was roughly 90 minutes. It was really too short to feel satisfying. Plus there’s the fact that all its centerpiece moments, including the ending, was shown during its pre-release trailer. It’s hard to get excited, let alone surprised, over a piece of new content when you’ve already seen everything it has to offer. Finally there was The Trouble with Clones, the piece of DLC that related to the overall Saint’s Row fiction. It lasted just as long as Gangstas in Space. This downloadable offering brought back fan favourite Johnny Gat in one of the worst ways possible and stripped him of all the wit and charm players knew him for. While your character eventually gained super powers such as super speed, enemy exploding punches and the ability to shoot fireballs from their hands, you’re only able to use them in the isolated ending segment. The one time that DLC offered players anything really significant and it's restricted in its use. To make matters worse, you cannot bring those abilities with you to the core game once the DLC has been completed. I understand that super speed may have broken the game mechanically, but I can’t buy that excuse for the fireballs and the super punches. Considering that in the main campaign, players can miss out on unlocking giant, people exploding fists, this would have been a nice alternative way to gain that experience. 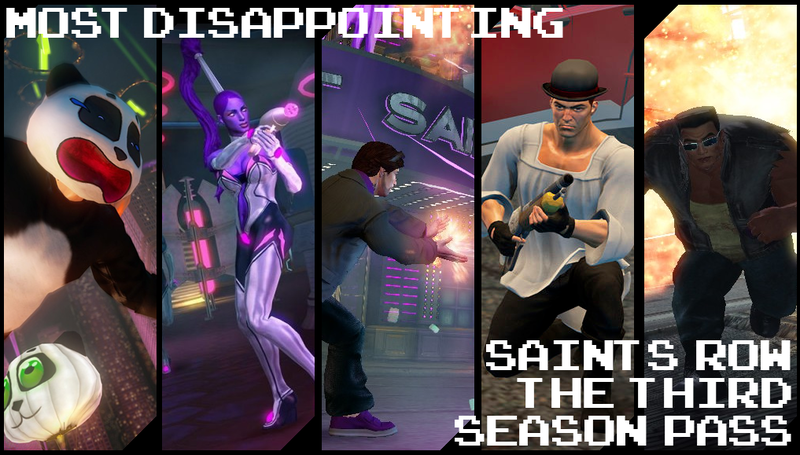 After playing through Saint’s Row: The Third’s season pass, I was not left with the satisfying feelings that the main game had previously filled me with. I was disappointed, and regretted purchasing each pack in advance. I guess that’s the risk with season passes, and unfortunately it didn’t pay off in this case. Did I mention the Season’s Pass also didn’t include any of the additional costumes, weapons and “homie” squad characters that THQ/Volition also released as downloadable content for the game? What’s up with that.